Ages 4-12. 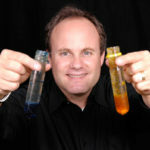 Steve Belliveau brings a fun action-packed science program where kids get to participate and learn how the world moves. Your kids will want to see a real Hovercraft, a human Gyroscope, a Giant Pendulum, The Tug of War of Science and a Rocket Car.